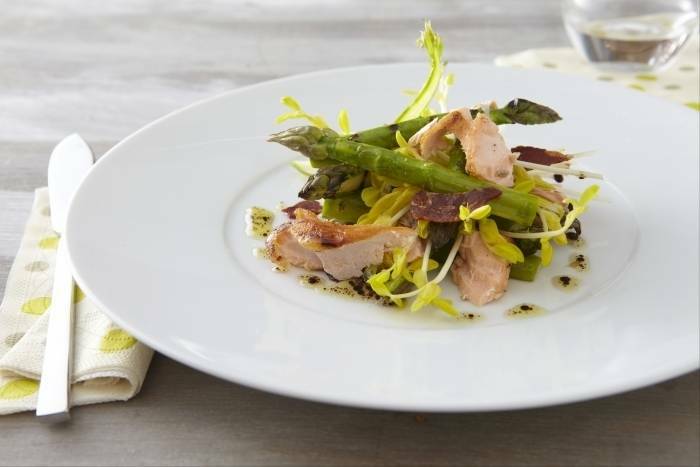 A lovely summer salad of grilled asparagus with the smokey flavours of trout and pancetta and the refreshing pea shoots all served with an olive oil and balsamic dressing. Bend the asparagus until it breaks to seperate the tender tips from the stems. Discard the woody part of the stem. Heat a griddle until smoking hot. Place the asparagus onto the griddle and cook for 3 minutes, turning regularly. Once cooked, remove from the griddle and toss in the olive oil, balsamic vinegar and sea salt. Set aside to allow the flavours to develop. Preheat the oven to 180'C. Lay the pancetta slices on to a lined baking sheet. Cover with a second sheet of baking parchment and a second baking sheet. This will keep the pancetta flat as it cooks. Transfer to the oven and cook for 8 to 10 minutes until golden brown and crispy. Break the smoked trout into flakes. Lay the asparagus onto a plate and then carefully add the flaked trout, pea shoots and pancetta crisps. Finally drizzle with the dressing used to flavour the asparagus.